I love superheroes. I have since I first laid eyes on them in my youth. There was a time period that I believe I would have rolled around in radioactive waste on the off chance I would have gained super powers. From early on Marvel and DC comics were enough to satisfy my super hero needs. I consumed vast amounts of Avengers, X-Men, Justice League, Batman, and countless others but I never ventured to far from the big two. There was my brief love affair with Miracleman before it fell into publishing limbo. I tried the early Image line but pretty didn’t mean good and I quickly retreated back to Marvel and DC, which weren’t a lot better in ‘90s but there were still titles like Starman and Waid’s Flash that scratched that superhero itch. Then I found Astro City and fell in love and then Wildstorm of the late ‘90s occurred with Ellis and Hitch’s the Authority and Casey’s Wildcats and I suddenly was outside the big two for some super hero action but DC purchased Wildstorm and neutered the books and I didn’t venture out again for some time. I noticed Image was changing in the mid 2000s as they became more adventurous with their titles and became home to more sci-fi and horror titles. The jokes made at the expense of Bloodstrike, the New-Men, Bloodpool and countless other stereotypical pretty Image books with no substance no longer held true. And while I picked up several Image titles I didn’t get into their super hero titles. I’m not sure why. 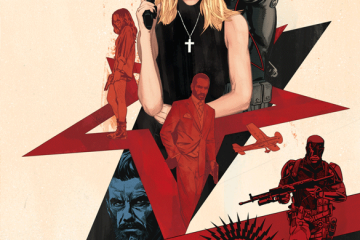 Maybe it was the fact that their was a renaissance of sorts going on at the big two as well as the zeitgeist of the Ultimate line coming from Marvel comics. 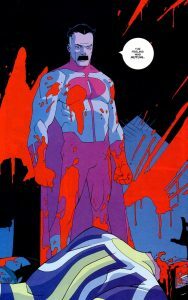 Maybe it felt like nothing new was being done and so much of what ‘indie’ super hero comics was simply an homage to the big two and void of new ideas. I’m not saying this is a fair comparison, just my thoughts at the time. Either way I missed out on Invincible, as I unfortunately didn’t give it the time of day, thatis until it was finally wrapping up. So as the title says, I am very late to the party when it comes to Invincible. But I am about to rectify that as I am jumping in feet first as I am taking on the entire series and am planning on chronicling the entire experience. If you’re a longtime fan please don’t spoil it for me. If you’re interested in joining me for the journey then come along for the ride and share your thoughts. Either way please follow along with my endeavor. I’ll be honest, I pegged Robert Kirkman as the Zombie guy pretty early on with the Walking Dead and then the Marvel Zombies series of mini-series. I read the Walking Dead when it was first released and stuck with it for almost a hundred issues before the repetition began to bore me and the fans of the television show tried to correct me where TV and paper diverted. Luckily those same fans were desperate for the comics and I sold my copies for a nice chunk of change. I never got into Marvel Zombies other then their original appearance in the Ultimate Fantastic Four. So unfairly I just thought of Kirkman as a horror writer with a Zombie fetish. So I didn’t give his super hero work much thought. I was aware of Invincible but to me it looked like a riff on Superboy and seemed firmly wedged into the Savage Dragon universe, a universe I know of but have never gotten into to (maybe someday). Boy was I wrong. Before I opened this trade I had no idea what I was getting into. By the time I closed it I needed more. On its surface Invincible is a take on DC and Marvel comics. 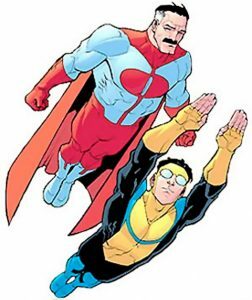 Invincible has a modern err of Superboy while Omni-Man (Invincible’s father) reminds me of a Silver Age Superman with over the top powers and very few weaknesses. Omni-Man’s team is clearly a play on the Justice League of America while the Teen Team that Invincible finds himself aligned with obviously is homage to the Teen Titans. Yet after you get past these superficial similarities Invincible is much more than a new take on classic stories. Invincible is a human drama that uses superheroes to tell this story. 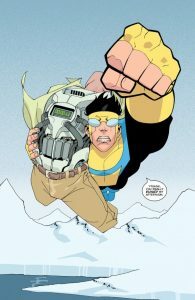 Invincible started with a bang as our young hero is dealing with a situation where a bomb has been strapped to a man and to make sure civilians aren’t hurt Invincible has flown to the arctic and lets the bomb go off. 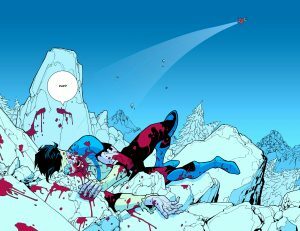 An interesting open and something that you have to become used to in Invincible– there’s a lot of death. From the beginning the book is bright with a spring like color pallet but don’t be fooled by this brightness as the more I delved into the title the more I realized this is actually a pretty dark comic. Not shocking coming from Robert Kirkman who seems to revel in putting his characters through hell. 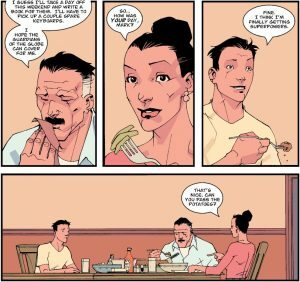 I really enjoyed these first four issues of Invincible collected in Family Matters and getting to know Mark Grayson (Invincible) as well as his family and friends. Not only is it a fun introduction to a hero but also a nice slice of life for a super hero family. I love the Grayson family dynamic, whether it’s washing super hero uniforms or origins stories of a young Mark finding out his dad is a visiting alien who assimilated to earth culture or his dad going missing in an alternate dimension, which seems to happen a lot to Omni-Man, so much so that he rounds down to the months he’s been gone so not to worry his wife. It reminded me somewhat of a teen drama as Mark deals with changes to him body, relationships, school bullies and mean teachers (who happen to turn students into living bombs). He interacts with the Teen Team and meets Atom Eve, a fellow student super hero at his high school, as well as the other members of the team Robot, Rex-Splode, and Dupli-Kate. Mark doesn’t join there ranks but is willing to lend a hand when needed. The stories collected here are very much an introduction to the characters and series and I’m sure they attracted many a reader back in the day. Kirkman has a writing style that makes readers care for his creations and Cory Walker had a fun style to his work. It’s realistic and dramatic and fit perfectly with a super hero tale. I wasn’t blown away with the first volume but I was interested enough that I dove right into the second volume. 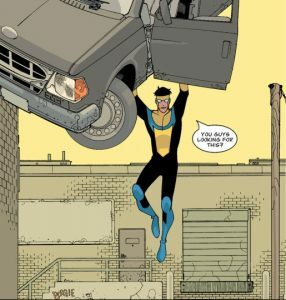 Where Family Matters was an introduction to Invincible the second volume, Eight is Enough, establishes what Invincible is going to be a be- a superhero story that is incredibly human and willing to takes risks. Eight is Enough also sees original artist Cory Walker leave the title and new artist Ryan Ottley join the book. Although clearly different artists their styles are not vastly different so I didn’t feel that jarred by the switch. What is jarring is the tonal shift in the title and the WTF moment that ends this volume. Eight is Enough begins in the same vain as Family Matters. We’re still getting to know Mark as he is still learning his role as Invincible. I loved the first story where Mark gets a phone call (remember those) from his dad that he needs Invincible to fly into space as an unknown object is entering our solar system. Enter Allen the Alien and in typical superhero fashion Mark and Allen throw down without even discussing why they are fighting. In typical superhero fashion though they soon realize they are on the same side and that Allen has actually been visiting the wrong world for years. See Allen’s job is to check on the planet defender of various worlds so he travels the universe picking fights with each planets champion to see if they are up to snuff. Well apparently Allen isn’t a very good speller and has been coming to Earth rather than Urath. Our slice of life story continues as Mark goes to visit a college, as most normal high school seniors do as they prepare for their futures. Atom Eve, who we met in the first few issues of the book, becomes more prevalent when she finds her boyfriend Rex-Splode having an affair with their fellow teammate on the Teen Team Dupli-Kate. I felt bad for Atom Eve but did love the comment that their were more than one Kate in the act that Eve happened upon, because why not have a group affair if your power is to duplicate oneself. The Teen Team, an obvious take on the Teen Titans soon comes apart as Atom Eve quits and Robot is set to join the Guardians of the Globe, the Invincible Universes version of the Justice League. Well he was set to join the team, until the book takes a drastic turn. The Guardians of the Globe were mentioned in the first few issues. Omni-Man was aligned with them and they often picked up the slack when he was otherwise occupied. When we finally meet the team it’s clear that the Guardians are analogs to the original big seven of the Justice League of America. Unfortunately we don’t get to see them for long as they are quickly and violently dispatched in a classic WTF moment, no doubt the first of many for Invincible, as a bloody Omni-Man stands over their corpses. I did not see this coming. I assumed that Omni-Man might die or be called back to his home world, leaving Invincible as the primary protector of earth. I did not see a villain turn coming but then I remembered this is a Robert Kirkman book so expect the unexpected and no one is safe. Once I got a hold of myself I reread the issue just because it was such a fun twist and redefined the series. This was no longer a fun family tale and Invincible was no longer going to be a well adjusted hero, he was going to be a hero with parent issues, just like so many heroes before him. Eight is Enough wraps with a funeral for the fallen Guardians of the Galaxy. Most of the heroes of the Image shared universe are in attendance, including Savage Dragon who gives an update on the investigation into the murder of the Guardians of the Globe. There are also two villains in attendance, the Mauler Twins (One’s the clone of the other but neither knows who the clone is nor wants to admit they are the clone- Brilliant) but promise they won’t cause any problems. We later learn they want to dig up the body of the Immortal, one of the fallen Guardians of the Globe. Of course you can’t put this many heroes together without an incident and of course shenanigans ensue as the butler for a former member of the Guardians, Black Samson, decides to attack the memorial for the prior treatment of his employer. He is quickly dispatched but the chaos is fitting for a funeral for a super team. The volume also rounds out with Mark and Eve (Atom Eve) growing closer but not that type of closer. More as friends and somewhat partners as they are both unaffiliated superheroes that attend the same high school and obviously know how to relate to one another. I like that a romance isn’t forced here. It will probably happen later but I’d like some tension before we get to it. Brutal. Physically and emotionally brutal is the best way I can describe the third volume of Invincible. It doesn’t begin this way. Robot, who was on the cusp of joining the Guardians of the Globe is tasked with creating a new version of the team to fill the gap left by the demise of the original version. Tasking Robot with this job is Cecil, a more laid back Nick Fury type, who is twenty levels above the President on the classification chart and is responsible for the super humans on earth. The tryouts are fun, my favorite was Monster Girl who has the appearance of a pre-teen even though she is 29. Every time she uses her ability, to morph into a giant monster, she de-ages a little more. So she’s a hard drinking and smoking pre-teen who likes to hit on older men. The awkwardness was a fun read. The brutality comes thanks to the Mauler Twins, who have been able to resurrect the Immortal who make a beeline after Omni-Man since he remembers who is responsible for his death. Omni-Man makes quick work of the Immortal again but does it in front of his son. Invincible is obviously full of questions and answers he will receive. Invincible learns that his father is not from a benevolent alien race tasked with protecting other planets. Rather he is a Viltrumite form the planet Viltrume, home of the Viltrumite Empire. We discover that each Viltrumite is born with super strength, flight, and a long lifespan. Over the course of thousands of years the Viltrumite have dispersed around the Universe and have violently taken over worlds to create their empire. Nolan Grayson, Omni-Man, was tasked with coming to earth and preparing it for future invasion. He was to keep the world docile and eliminate any potential threats to the invasion and this is why he killed the Guardians. To him the human race are insects; pets, since he will outlive them all and he needs Mark to get onboard with his plan and the task assigned by the empire. Mark refuses and an epic family throw down commences. This is where the brutality comes in. Invincible vs. Omni-Man is a world shattering, catastrophic battle that covers the earth. Cities are destroyed. There are mass causalities as Invincible does everything within his power to stop his father and protect the human race. Unfortunately Omni-Man is stronger and has far more experience and apparently has no problem beating his son to a pulp. Yet there is some emotional tie as at the end of the battle as Mark somehow reaches his father’s emotional core and seemingly out of love for his son Omni-Man leaves the planet leaving carnage in his wake. After the epic battle there is a sense of sadness. Kirkman plays with some raw emotions, as everything Omni-Man said was recorded by Cecil and not only played for Nolan’s wife but the entirety of the world. Mark is in intensive care for weeks as he heals from his wounds. A cover story for Omni-Man’s exit is constructed that Mark’s father died in a car accident and Mark agrees to become Cecil’s go to super hero as long as his mother is financially taken care of and his college is paid for. At the end of Perfect Strangers I was emotionally spent. I had so many thoughts and questions about what was going to happen next. I wanted to leap into volume 4 but reality and life got in the way. 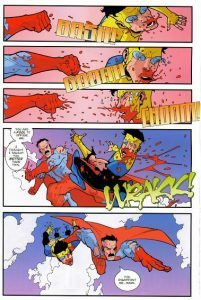 Yet I now understand why Invincible became a popular title early on. Next I will have to see if it can continue to hold my interest.